OSWEGO, NY – EJ Construction Group out of Liverpool has continued its annual sponsorship of the SAFE Fair with an increase this year to the Gold Level. Bonnie Caza, left, of EJ Construction Group with Teresa Woolson, President of the VOW Foundation. Bonnie Caza is the office manager at EJ and volunteers for many community events. 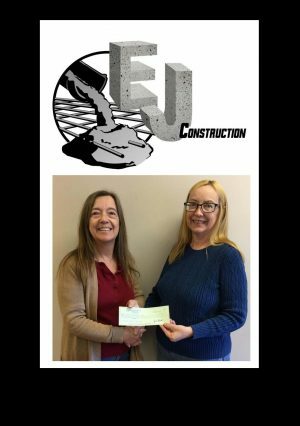 “EJ Construction is proud to be a part of this annual event that continues to bring substance awareness to the youth of Oswego County. We look forward to this year’s event and encourage everyone to stop by the SAFE Fair on April 30. Substance abuse and addiction affect all of us and through events like this one we can make a difference!” Caza said. Please visit and thank our sponsors – EJ Construction Group, Eagle Beverage, Entergy, Mystic Music Entertainment Services, InterFace Performance Materials, iHeart Media, Exelon Generation, Fulton Savings Bank, BioSpherix Ltd, Oswego Elks Lodge, Honorable William Barclay, Farnham Family Services, Channel 9 News and Pathfinder Bank. Keynote speaker for the event is Lee Livermore, public educator at the Upstate New York Poison Center. There will be a presentation on anxiety by Miwa Burdic, health student at New Visions and a local singer/songwriter Erica Perwitz will perform a song she wrote. Mystic Music Entertainment Services has games lined up for the youth. Additional plans include carnival type games with prizes, activities at some of the participating exhibitors, a craft table with supplies for making a wooden bank, a stress reduction table with supplies for adult dot-to-dot and coloring activities. Donations are being gathered for door prizes and raffle baskets, which are being designed by Meggan Gauger, a newly elected board member of the VOW Foundation. Free face painting will be provided by volunteer Charlene Himple. It’s scheduled for April 30 from noon to 4 p.m. at the Oswego Elks Lodge, 132 W. Fifth St.
For more information, to volunteer or donate, please contact Woolson at (315) 402-6119.